How Far is Sai Nikita Nikis Brundavanam IV? Sai Nikita Nikis Brundavanam IV, a residential project developed by one of the well-known developers in the city by Sai Nikita Estates Private Limited. 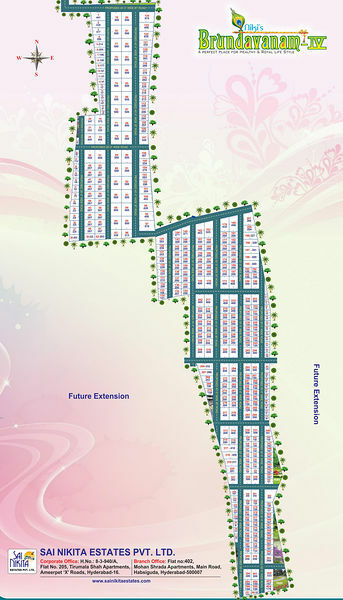 One of the plot project in Hyderabad which offers plots for sale in Bibi Nagar locality. Being located in one of the strategic locations this project offers all the facilities which are required to fulfill the needs of the residents. Sai Nikita Nikis Brundavanam IV is thoughtfully situated in Bibi Nagar this project offers location advantages because it has the best connectivity to other parts of the city and to well-known educational institutions, hospitals, IT companies and to commercial complexes in addition to this the locality is close to outer ring road and to the railway station. Come and be a part of this excellent project and build your dream home with your own design, interiors, and exteriors. pollution-free environment, fencing for security, convenience store, avenue plantation, and many more facilities are there to make sure the residents have a hassle-free enjoyable life at Sai Nikita Nikis Brundavanam IV.